Battle, collect and navigate your way across the great expanse of the cosmos. Use your powers to dominate the tainted beings of the mysterious rift, building an army of powerful warriors, beasts and gods from across the Aeons. Using AUGMENTED REALITY players experience an addictive skill-based real-time battle system. Collect heroes from across spacetime and do battle with the tainted forces of Rharkon. Each character is equipped with a myriad of attacks, some reliant on brute force and others on mystic or dark capabilities; allowing for a perfect combination of skill, strategy and foresight. If crushing friends in the arena isn’t your preferred option, the game also compensates for the competitive lone-wolf with an elite single player exploration mode that will test and hone the skills of any avid gamer. You are a Riftlord – a mortal chosen by Genesis to end the final influence of Rharkon and his DarkTide. You must venture forth into unknown Times, using your power to dominate the tainted beings of Time & Space; Building an army of gods, warriors and beasts from across the Aeons. Explore a randomly generated universe and fight your way through it’s depths. Your task is to keep order, and protect the Universe from the chaos of Time itself. COMPLETE the tutorial and claim your FIRST hero. 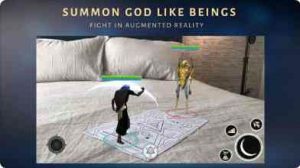 FEATURED ON UniLad Gaming, The Gaming Bible, 8Gaming, Fraghero and EverydayGamers – Genesis is Augmented Reality Gaming at it’s finest. SUCCESSFULLY FUNDED on Kickstarter – Genesis is the 7th most Crowdfunded mobile game of all time.